This artwork is covering a lot of emotion i have about life and i wanted to cover things like evolution, creation, the environmental issues we are having in one piece of art. It tells the story about humanity in contrast with nature. 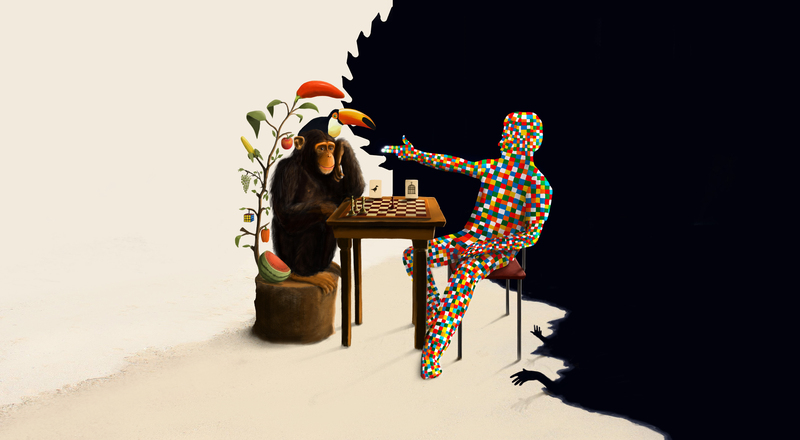 The human character is created from rubix cube colors. We as humans do not want to be fixed. We force our imperfections onto nature. The rubix cube hanging in the vegetable tree is completed and well done. Nature is and has always been an inspiration to mankind. We look at a bird and build a plane, which is nice, but bad for the environment and a poor representation of a real bird. The pistol symbol made by the human character is figurative in the way that we are not literally shooting nature, but by the way we treat nature, we are killing it. The tree trunk the ape is sitting on is related to the saw symbol in the background. We are destroying forests and the home of many animals. The Dark blue background to the right with the hands coming from the shadows are representing the negative influence we have on things that are actually already perfected. The nature side of the picture has the major chess pieces. The Tower, The Queen and the King. The Human side only has the King left. Although its not checkmate, he will lose in the end. The King of the human side is also the exact centre of the artwork, because we are always trying to be in the middle of everything. The human character build from rubix cubes resembles both the 2D and 3D aspects in art creation. A very nicely well thought out and done picture. Is this all painted? The ape is sitting on a treetrunk that has been cut down. So the saw blade from the background resembles the destruction of the forests. Artistic, I like it ! So much thought, so much emotion, so much truth! Fabulous piece.